"Tellereisen auszulegen ist strengstens verboten. Die gefangenen Tiere sterben oft qualvoll." From Deutschland to Decatur leghold traps are continuing to main cats and kittens. Whether they are set in order to trap wildlife or purposefully employed to target felines, the result is universally the same: excruciating pain, dismemberment, and often death. Animal protector Karin Oettmeier was appalled that the illegal device was used to trap Moppel. "Tellereisen auszulegen ist strengstens verboten," she told Bild in the article cited supra. "Die gefangenen Tiere sterben oft qualvoll." 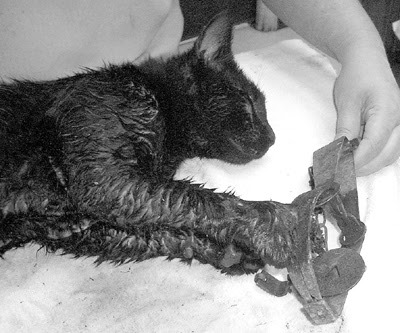 In Decatur, Alabama, the departments of Fire, Rescue, and Public Works were forced to use their water trucks in order to flush a young black male cat out of a sewer where he had unwittingly fled on August 10th after getting caught in a leghold trap. (See photo below.) Unlike Moppel, there is a good chance that the unnamed cat will lose one of his front paws. "Of course the cat was stressed that it couldn't get out and panicked and ran into a storm drain," Animal Shelter Director Mindy Gilbert told The Decatur Daily on August 11th. 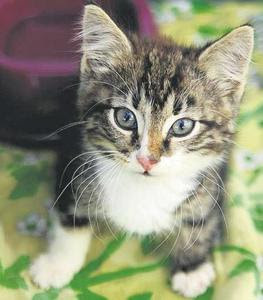 (See "Three City Departments Unite to Rescue Cat Caught in Trap.") The narrowness of the sewer pipe precluded officials from manually rescuing the cat. 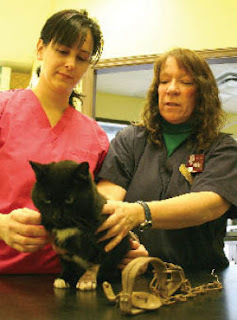 The cat was treated by veterinarian Steve Osborne and remains at the shelter. Since he was not wearing a collar, officials do not have any way of contacting his owner or even knowing for sure that he has one. While leghold traps are not illegal in Alabama, their use is frowned upon by Gilbert. "What would happen if a child accidentally ran into it?" she asked. "And if you capture a wild animal by the leg, what do you do with it then? This cat was hard enough to handle." 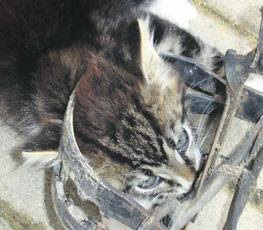 Besides, the shelter lends humane traps to the public and will collect any animals that are trapped. There is no place in any halfway humane society for the use of leghold traps and this applies equally to wild as well as to domestic animals. Unfortunately, these traps are difficult to trace and no arrests have ever been made in any of these cases. One possible means of altering this deplorable situation would be to encrypt leghold traps with serial numbers that are then stored in a database. That would be of some assistance to the police in apprehending individuals who misuse these devices. It would be better yet if countries such as Deutschland, Canada, and the United States were to outlaw their manufacture, importation, sale, and use altogether. That would require citizens of these countries to take animal cruelty seriously for a change, however, and that is not about to happen anytime soon. Photos: Andreas Wetzel of Poerschmann and Thomas Schroeder of DeFodiM.V via Bild (Moppel), The Decatur Daily (unnamed black cat), Kelowna SPCA (Hopalong Cassidy), and Carol Aun of the Mission City Record (Trapper).